SVDH DESIGN specialises in interior-designs in combination with own products. An interior reflects one’s personality, which makes every interior unique. Home should be the place where you love to spend your time. Where you feel good. By keeping the basic design clean, unity is created. A home with a neutral and tasteful character, including many natural features. These natural features provide a contemporary interior, appealing to a large audience. Products by SVDH DESIGN are applicable in many interiors. By reusing existing products and giving them a new function SVDH DESIGN strives to make a contribution to ecological preconditions. The right illumination is crucial to do justice to the interior of any home. For a large part, it determines the atmosphere and peace of a home. SVDH DESIGN is specialised in drawing lighting plans. The lighting plan that will be developed will combine ambient lighting, task lighting and accent lighting. Are you looking for an unique light fixture? SVDH DESIGN brings the warmth of nature back into your home. A combination of natural materials and modern techniques ensures that every lamp is unique. A beautiful work of art for you home. 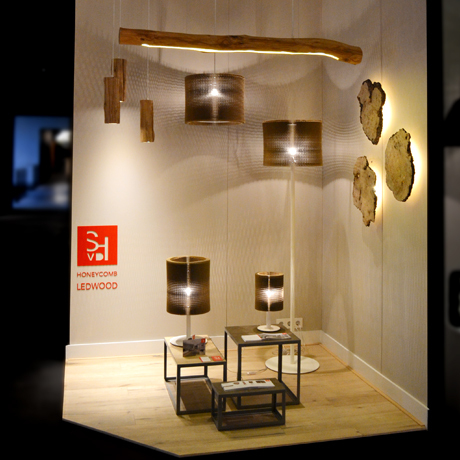 Maretti lighting loves to work with talented Dutch designers. The out of the box designs of SVDH DESIGN fit perfectly in our collection. Within our extensive production facilities we fabricate each armature exactly like the designers want. As such they keep complete creative control of their interior projects. We can work with any material so the design possibilities are endless. Maretti provides not only technical support and usability, but also energy and cost savings for the user. This intensive cooperation always leads to strikingly beautiful results and satisfied customers!